Intel has an ambitious goal for 2014: get its Atom chips into 40 million tablets, or four times the number of tablets that had Intel inside in 2013. But rather than do it by tailoring its products to what tablets now demand, the cash-rich company has another plan: pay tablet makers to use its chips. That's essentially what Intel is doing through a program first disclosed at its financial analyst meeting in November. Intel will pay tablet makers to cover the additional component costs of using its Bay Trail chips instead of ARM-based processors, and it will also help cover the engineering costs of designing an Intel tablet. The Intel division that makes Bay Trail will incur a "significant increase" in its operating loss to pay for the plan, CFO Stacy Smith said at the November meeting, but the upshot is likely to be a lot more tablets based on Intel chips, potentially even from big players like Samsung. "Basically, they're making an investment to make up for them being slow to get into the market," said Dean McCarron, principal analyst at Mercury Research. CEO Brian Krzanich shed a bit more light on the plan during Intel's quarterly earnings call Thursday when he was asked what proportion of Intel-based tablets will be supported by its so-called "contra revenue" subsidies. After a bit of hesitation, Krzanich said that "the majority of projects we have in 2014 use some level of contra revenue." That confirmed what many analysts suspected: If you pick up a Bay Trail tablet this year, chances are Intel will have paid the manufacturer to cover the cost of using its chips. It's not hard to see why Intel is being aggressive: PC sales are in the toilet and the chip maker has been left behind in the hottest market in personal computing. The vast majority of tablets today use ARM chip designs manufactured by the likes of Samsung, Apple, Nvidia, Qualcomm and China's Rockchip. One cause of Intel's problems is that Bay Trail was designed for the high end of the tablet market, where Windows 8 has performed poorly. Intel now sees its biggest opportunity in lower-priced Android devices, but it's stuck with Bay Trail until new Atom chips code-named Broxton and SoFIA come out in 2015. Analysts say Bay Trail is a good performer but doesn't have as much functionality integrated onto the chip as other tablet SOCs, so it creates a higher "bill of materials" for tablet makers. That means they need to buy additional components for functions like communications, or print additional layers onto Bay Trail circuit boards, Krzanich said Thursday. With contra revenue, Intel is paying tablet makers to cover the additional bill of materials (BOM) costs. "This is not a price reduction; it's truly a BOM cost equalizer," Krzanich said. It will also pay for "non-recurring engineering" costs, which means it will cover the cost of taking an ARM tablet design and porting it to an Intel chip. Intel hopes the subsidies will seed the market with x86 tablets, and that next year, when Broxton and SoFIA appear, it will no longer need to pay them. Those chips will be more integrated than Bay Trail. SoFIA, for example, will come in two versions, one with integrated 3G and one with both 3G and LTE. The bill of materials cost for a Broxton tablet will be US$20 less than for Bay Trail, Krzanich said. SoFIA, with its greater integration and smaller die size, will cost even less, he said. Even with SoFIA, though, Intel will make a significant concession: The chip will be manufactured not in Intel's own fabs but by contract manufacturer TSMC. That reflects Intel's need to get the product out quickly, said Nathan Brookwood, principal analyst with Insight64. "When Intel looked at all the different pieces of [intellectual property] they would need for a low-cost, integrated part, many of them are available off-the-shelf at TSMC. They realized it would be easier just to port Atom to TSMC's 28-nanometer process," he said. To put Intel's target of 40 million tablets this year in context, Apple sold about 70 million tablets in its fiscal year that ended last September. Some analysts think Intel will reach its target. "If you'd asked me six months ago, I would have been a lot more skeptical," said McCarron at Mercury Research. But the contra revenue plan makes it "cost neutral" for tablet makers to use Bay Trail, he said. In addition, Intel chips and Microsoft's OSes are no longer "bolted together" as they were in the past. "The breaking of that, and actually seeing vendor interest in Intel-based Android systems, changes everything," McCarron said. The subsidies should help Intel find its way into millions of low-cost tablets produced in China, but Bay Trail may also find traction among top-tier vendors such as Samsung, Hewlett-Packard and Dell, said Patrick Moorhead, principal analyst at Moor Insights and Strategy. "I expect there to be more Intel silicon overall at Samsung in the future," Moorhead said. He expects the 40 million tablets to be split about evenly between China's Shenzhen region, where many low-cost tablets are produced, and top-tier OEMs. "The ones to keep an eye on are Apple and Samsung," McCarron said. "It's difficult to imagine Apple making the transition -- that's a difficult one for me to get my head around. But Samsung might be a little more open and flexible." 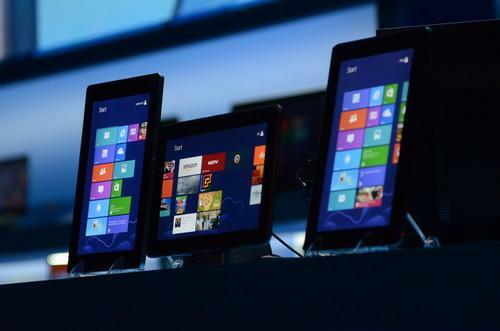 For Intel, finding more business among tablet makers is a matter of urgency. "This market is moving on, and Intel needs to be a part of it," Brookwood said.